What do I need to do to be a qualified participant in the ORPCA Autocross Program? Your car will need to pass a tech inspection. Go to: Tech Inspection info. Your helmet is part of this inspection so be sure it meets our Snell SA2010 or M2010 requirements. You will need to have a unique number for your car. See “Car Numbers” below. You will need to class your vehicle. Complete information can be found in the section below called “Classing Your Porsche”. This includes Non-Porsche classes as well. If you drive you will need to work. We run in 2 groups – one drives while the other works to monitor the course for the drivers. More information on working at Autocross can be found at the bottom of this page. We have instructors and loaner helmets to help new drivers. Points are awarded as follows: 10 points for first place in class, then 8 for second place, 7 for third and so on. These points are dependent on the number of cars in the run group. Changing classes during the season is discouraged. Points cannot be moved from class to class. The only exception is if you drive in a lower classed car, you can run in a higher class for points in that higher class. The season consists of 7 events, however, only 6 count toward a championship trophy. If you run all 7 events your lowest score will be dropped. You must run at least 5 events to qualify for a trophy. When you register for an Autocross event, you will be asked to select a car number. All one and two digit numbers are reserved for ORPCA/PCA members only. If you do not have a previously approved number you can put in a number — if you cannot select it, that means it is already taken. Keep trying until you find a number you can select. This number is your official car number for the event and remainder of the season. Be sure to get your official number at your first autocross before you invest in magnetic or stick-on ones. In order to run in Autocross, car numbers must be displayed on BOTH sides of your vehicle BELOW the window line. Numbers must be a minimum of 8-inches tall, in a color that contrasts with the paint. The numbers must be highly visible so that they are easily read. Numbers with tape on windshields or side windows are NOT ACCEPTABLE. The Starter will not permit cars with inadequate numbers to drive the course. Special auto-body-shop tape is available by ORPCA in multiple colors. This tape will not damage auto paint. Choose the color that best contrasts with your car color. Bring a cloth to dry your doors before applying tape on rainy days. Magnetic numbers are readily available online. We recommend individual numbers for flexibility if you participate in other events. 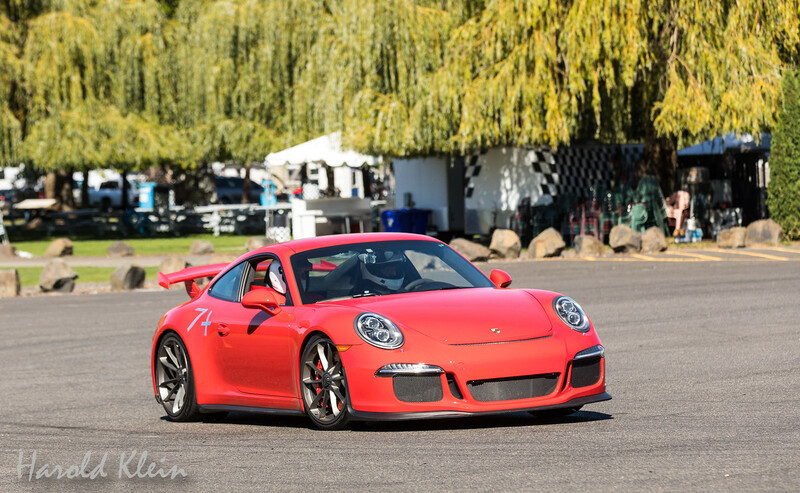 There are four Porsche categories of classes – Showroom Stock, Production, Improved and Modified. Categories are related to automobile configuration. The Showroom Stock (S) Category contains classes of automobiles as normally delivered and specified for use in the United States and Canada. Factory options as normally available for a specific model year are permitted. Certain factory and/or dealer installed equipment/ options will move an automobile out of S and into Production or higher. The Production (P) category contains automobiles (as normally delivered to the United States and Canadian public through authorized sales outlets of the manufacturer) plus others with limited performance-affecting changes from stock. R compound tires move a car into the Production category. The Improved (I) category contains automobiles with more substantial performance-affecting changes from standard (stock) specification, whether changed by the factory, dealer or owner. These modifications have defined limits. The Modified (M) category contains automobiles that have performance-affecting modifications outside of the limits of the Improved category and for race automobiles (factory-built or otherwise). For a list of cars and classes with further classing information, please go to: Car Classifications. If your car classing changes during the season, you must notify the Event Coordinators. In addition, your championship points at the end of the year will reflect the highest classification that you ran during the course of the season. Failure to make a complete stop in the proper area (where marked), if required, after a timed run will result in a DNF. Drivers must obey flag signals or risk being removed from the event and/or disqualification. Green – Go. The course is clear. Red – Emergency. Pull over and stop safely. The track worthiness of the automobile competing in the autocross is the responsibility of the entrant(s). The safety inspection form must be complete to compete in the autocross. The inspection form will list all of the items to be inspected. Tech Inspection Information can be found here: Tech Inspection info. If you are a Novice or a first timer with our group, we highly recommend using an instructor for your first Autocross run. After that, it is up to you if you prefer to have an instructor or not. Instructors will be available to everyone whether you are a novice or seasoned driver. If a cone is toppled, there is a 2-second penalty for each cone. If a cone is still standing but it has been moved completely out of its box, there is a 2-second penalty. Note: If a cone has been hit but remains standing and is at least partially inside its box, there is no penalty. Cones hit before the start or after the finish count as penalties.